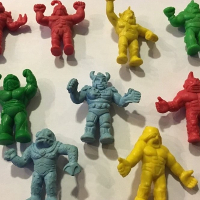 The first auction, Vintage 1984 MUSCLEMANIA Figures SELECT MUSCLE Men LOT 10 PREDATES M.U.S.C.L.E., highlights one of the very strange parts of MUSCLEMANIA collecting. The starting bid of $40 isn’t too bad. Four dollars per figure isn’t a bad price if you need specific MUSCLEMANIA figures. However, these are all common figures that MUSCLEMANIA collectors already own. The truth is that there aren’t many MUSCLEMANIA collectors. And the it doesn’t attract new collectors. That doesn’t matter for the handful of passionate MUSCLEMANIA, but it does make it harder for sellers. The only thing that might attract longtime MUSCLEMANIA collectors is if the figures were in incredibly good condition. If it allowed them to upgrade their figures, but these look like the type of figures that need to be upgraded. The lot also reminds me the I need to finish another MUSCLEMANIA post. 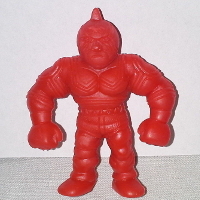 The second auction, Mattel MUSCLE Men Super Phoenix #113 **RED CLASS A** Kinnikuman Man *RARE & MINT, continues the recent trend of Class A figures with $0.99 opening bids. We sure have seen a lot of Class A figures recently. It’s almost like they are not as rare as hysteria would suggest. Frankly, I’m burnt-out on Class A figures. The last time a Red #113 sold it was for $201.50 as part of a seven figure lot of Class A figures, which featured the very popular and desirable Purple #2 (two of them actually). That suggests to me that this figure is probably under the top-dollar wave, instead of riding it. When I say I’m interested in watching auctions it is often pure curiosity. A figure or auction isn’t automatically interesting to me because it is a Class A figure. Honestly, it is difficult to pinpoint exactly what piques my interest. But I can say, without an ounce of hyperbole, that I’m just as interested in the third auction as I am in the second auction. The third auction, Vintage 80’s M.U.S.C.L.E. 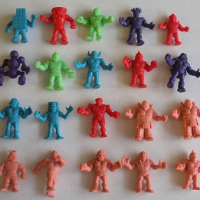 Men lot 20 figures (blue, purple, green, red, flesh), is a basic lot of 20 M.U.S.C.L.E. figures. It reminds me of the lot of 20 figures I listed last year. The third auction started at $0.01. Where will it end? I wonder if the final price for the third auction will be similar to my lot of 20 figures. If I was a betting man, then I would say, “Absolutely.” I think these types of auction can help to showcase the significant difference between price and value. Or not. Either way, I’m still curious. 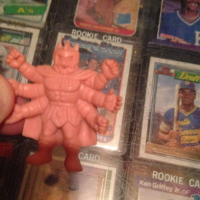 The fourth, and final, auction, Rare Three Headed Head Muscle Man Mattel 1980s Satan Arms, has probably already been noticed by many M.U.S.C.L.E. collectors. 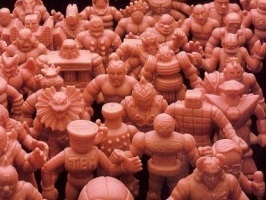 These types of auctions are always the result of sellers, and potential sellers, discovering there are some M.U.S.C.L.E. figures that sell for more than a few cents apiece. When I copied the auction description I was ready to eviscerate this seller. I was ready to tell you the seller was lazy or greedy or anything else negative. Then I had, what felt like, the worst epiphany. Sometimes there are no explanations for these absurd auctions. More accurately, I believe that sometimes there are no rational explanations that we can see as buyers. Greed is a little obvious, but true stupidity can sometimes be harder to see. I am not talking about the term “stupid” we conversationally throw around. I literally mean individuals with limited, or very limited cognitive ability. Some of these absurd auctions could come from loneliness; wanting to feel important, special, or interesting; and maybe it’s some messy combination of all of those things. Maybe it is even misplaced hope, “If I can sell some of these, then I’ll be able to do X.” Maybe it’s a daydream they think they can influence or will to happen. I don’t know what made me recoil from this auction. It would be very easy to laugh at and that might be the most appropriate response. For me, this time, it made me feel kind of sad. If you felt nothing, then you might be a sociopath – or a well-adjusted collector. But if you are neither of those things, what was your reaction to the final auction? Oh, and the figure was just a mundane, Flesh a #109. I meant to say that earlier. This entry was posted on Wednesday, March 16th, 2016 and is filed under Auction Watch, UofM News. You can follow any responses to this entry through RSS 2.0. You can skip to the end and leave a response. Pinging is currently not allowed.